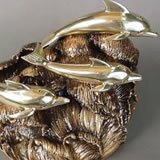 Traditional bronze urns for human and pet memorials. A bronze cremation urn is the most traditional type of urn and the heaviest. A cast bronze urn is made from a sculped mold, usually using a lost wax method. All fabricated and sculpted bronze cremation urns are available in a wide selection of sizes and shapes.